Helen Engelhardt, poet, writer, storyteller and independent audio producer of Midsummer Sound Company, lives in Brooklyn, N.Y. Her work has appeared in national journals and international anthologies, her audiobooks nominated for "audies", her storytelling performance awarded the Hemingway Days prize. 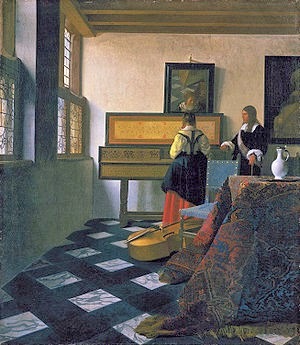 Poems featured here are part of a series inspired by Vermeer's paintings. 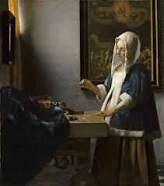 "I chose Vermeer because his body of work is, with only four exceptions, focused entirely on the intimate, interior life of women. " Visit her at midsummersoundcompany.com. of the instrument, declaring his intentions. His unguarded face awaits her mercy. a fluted column, neither resist nor comply. in the mirror, wherein we can lose ourselves. who kneels before an unseen lady. is over. The music has not yet begun. jewels poised upon her palms. both my soul and my songs abiding. 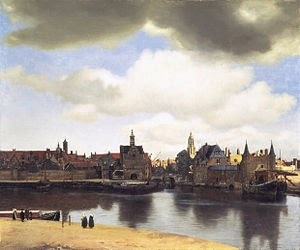 of sobriety, shook Delft to its foundations. the pointed turrets of the East Gate? and so does the water.